Aberdeen Angus beef is famous for being consistently succulent and flavoursome. This wing rib makes a stunning roast for a special occasion or when feeding a crowd. Preheat the oven to 220°C, gas mark 7. Weigh the joint and calculate roasting time, allowing 12 minutes per 500g for rare, 18 minutes for medium and 25 minutes for well done. Cook the beef in the oven for 15 minutes then reduce the oven temperature to 180°C, gas mark 4 and roast for the rest of the calculated cooking time. Meanwhile, sieve the flour and salt into a mixing bowl. Beat together the egg and the milk, then pour into a well made in the centre of the flour. Stir to form a thick smooth batter that coats the back of a spoon. Add a teaspoon of vegetable oil to each hole of a 12 hole muffin tin, then preheat the tray in the oven for 10-15 minutes. When the beef is cooked, cover with foil, keep warm and allow to rest. Increase the oven temperature to 220°C, gas mark 7. Pour equal amounts of batter into the holes of the muffin tin and cook for 20 minutes until the Yorkshire puddings are well risen and golden. 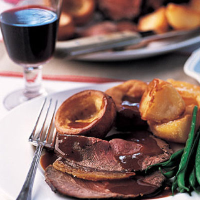 Serve with roast potatoes, green beans and gravy.